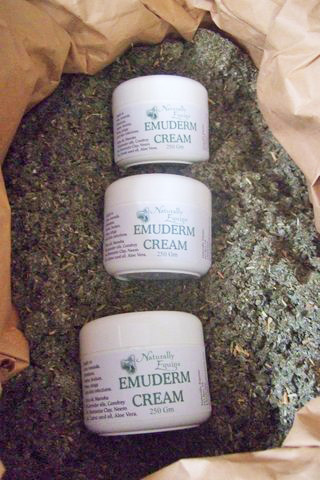 Beneficial when applied to rainscald, mudfever skin irritations, chafing, wounds and cuts. Highly recommended for use in every first aid kit and a favourite with our customers. This formulation comes from the best of nature’s own medicine cabinet. Emu oil is combined with the essential oils of Manuka and Lavender, herbal St Johns Wort oil in a cream base, and enhanced with the therapeutic oil of Neem. Neem oil’s highly concentrated anti-microbial active ingredients make it ideal for use on cuts, scrapes or serious skin conditions. The concentrated essential fatty acids help to restore moisture and elasticity to the skin while it disinfects and heals. St Johns Wort is anti-inflammatory/septic/bacterial and soothing, and indicated for use on dirty wounds, infections, swellings, abscess. 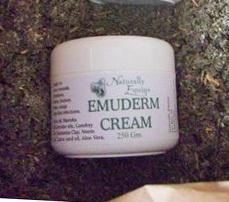 Emu Oil accelerates healing and decreases proud flesh formation, highly penetrative carrying any medication with it through the skin barrier, soothes swollen wounds after surgery or lacerations.